Update:"'The repository of over 3,000 muscle and DNA samples from across North America at the Neuromuscular Diagnostic Laboratory, University of Minnesota, has proved to be invaluable in further defining the histological, clinical, epidemiological, pathological, and genetic basis for specific muscle disorders in horses." Valberg and other researchers are unraveling the genetic basis for tying up. As equine genome mapping techniques progress, DNA-based tests are increasingly becoming part of the diagnostic approach to muscle disease in horses. Four DNA-based tests for muscle disorders in horses are available. Individual tests identify hyperkalemic periodic paralysis (HYPP), glycogen branching enzyme deficiency (GBED), malignant hyperthermia (MH), and type 1 polysaccharide storage myopathy (PSSM1). DNA diagnosis uses hair roots or blood samples, and provides a less invasive and more accurate diagnosis than histological interpretation of muscle biopsy. Tying-up is a generic term commonly used to describe muscle disease in horses. Other references to the same set of symptoms may be exertional rhadomyolysis, azoturia, Monday Morning Disease, and Market Day Disease. Monday Morning Disease got its name because when a horse had been performing his regular hard work and was given a day off, but his diet had not been reduced; he tied-up on Monday morning when he was returned to work." Call your vet immediately and blood will be drawn and tested. If your horse is tying-up there will be certain markers (elevated serum levels) in the blood. Basically three serum levels are checked. Elevations in serum levels of muscle enzymes are used in the diagnosis as well as visual symptoms. Enzyme elevations are indicators that there has been cell damage to the muscles. Sometimes you will notice that your horse's urine has a reddish or brownish tint. Some horses will have this happen only one time. These horses are referred to "sporatic" cases. Others will continue to have this happen. They are considered "chronic" cases. Research has shown that there are several reasons that horses may be chronically tying-up. There is a disorder which affects the horse's muscles. The muscles go into spasm or contraction. The second involves a problem with how the horse metabolizes carbohydrate. Often heavier breeds such as Quarter Horses, Warmbloods, and draft breeds have polysaccaride storage myopathy (PSSM). Research has shown that this is an insulin problem. Sugar or glycogen, is stored in the muscle which causes a metabolic problem. The horses tend to show signs of typing-up and are often calm in disposition. Do not feed them grain or sweet feed, exercise them daily, do not let them be inactive for any length of time, feed them rice bran (fats) to stabilize their blood sugar. This decreases storage of fats in the muscles. 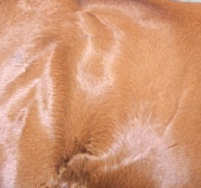 Horses that show repeated signs of tying-up are classified as "chronic" cases. I have had two horses over the years with a tying up problem. I found that if I cut all sweet feed or anything rich in carbohydrate in the horse's diet, they did much better. Also, I added a selenium supplement to the diet, every day. I did not buy this over the counter, but rather, bought it from my vet. When trail riding, I always carry banamine paste in my saddlebags in case my horse has a problem. One of the two horses had an episode and coliced from the pain. We almost lost him. Thus, the banamine. Of course, always ask your vet. I would also like to add, here, that Virginia is deficient in the mineral selenium. Because of this, I still make sure that the horses have enough selenium. My two current horses have never had this problem. Wherever you live, ask your vet if your area is selenium deficient. Update: Potential Biomarker for Tying-up Found "...In an equine study using "proteomic" technology that systematically analyzed the proteins in skeletal muscle biopsies, a research team from The Netherlands identified a form of the protein creatine kinase that could be a marker for acute tying-up in horses. 'Tying-up or rhabdomyolysis in horses is a serious condition that is characterized by obvious discomfort, abnormal muscle stiffness, and difficulties to move with short strides, muscle hardening/contracting with hindquarter spasms, and an elevated pulse and respiration. Eventually it can led to death,' wrote the group. The team, led by Edwin Mariman, Professor and Dr E.C.M., performed this research at the NUTRIM School for Nutrition, Toxicology, and Metabolism at Maastricht University Medical Center and the Department of Equine Sciences at Utrecht University in the Netherlands...."
"Exertional rhabdomyolysis, otherwise known as 'tying up' is a term used to describe a variety of muscle disorders in the equine athlete. Horses affected by tying up have varying degrees of muscle cramping or muscle soreness, with the more severe cases accompanied by elevated respiratory and heart rates, dark colored urine, and reluctance to move or stand. A balanced diet, including vitamins and minerals, is just one factor in the treatment and prevention of tying up. Here are some ways that two specific nutrients, selenium and vitamin E, can help prevent or alleviate symptoms of tying up: ..."